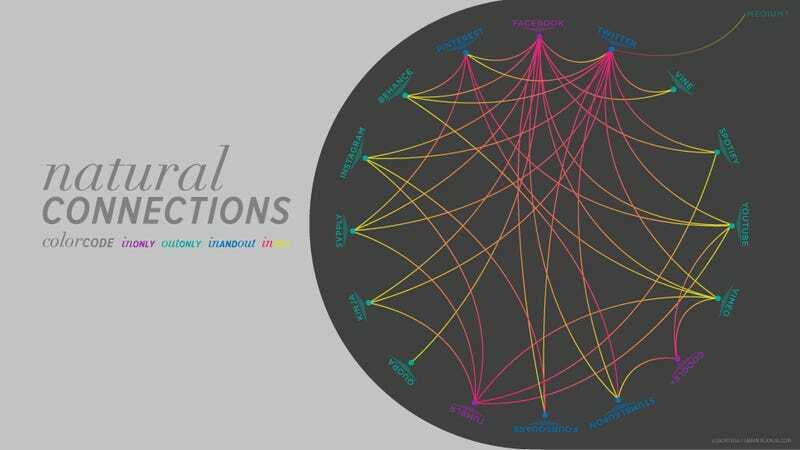 I published my first iteration of Natural Connections in social media with plenty of big players missing. I finally got around to updating the visual with a larger pool of platforms. You'll notice Medium hanging out in the corner. Being that only a select handful of people have been invited to publish there so far, and the only outbound function right now is Twitter, I'd rather leave it in question mark status. Adding a bit to my thought from the last post: It's interesting to see that one of the biggest traffic drivers on the web – Facebook – has no special link to any other site beyond a simple link. In a way it makes sense as that single link out to an actual story achieves the content consumers objective. They were looking for something fun, entertaining, informative, and Facebook helped them find it. The only other platforms that only accept inbound sharing without any external porting of their own are Tumblr and Google+. I don't know many people who dedicate a great deal of time to Google+ interactions, but that singular function of discovery through links sort of matches the function of Google search. Guess it makes sense? I'd imagine that'll change quite drastically for Tumblr whenever Yahoo takes over. Maybe it'll port to Flickr? Something I left out of this visualization, even in the second round, as I never found it particularly social. Might as well try to make one of their other properties grow more. Or maybe Flickr functionality will be rolled into Tumblr? No need to speculate further about that acquisition for now. The Internet will take care of that.